South Shields' joint manager Lee Picton. 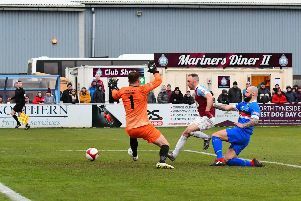 South Shields are looking to climb back to the top of the Northern Premier League when they travel to Grantham Town tonight. The Mariners surrendered a two-goal lead in the closing stages of Saturday’s match against Bamber Bridge to draw 3-3. The result ended their seven-game winning run in the league and left them second, two points behind leaders Warrington Town. With Warrington not in action tonight, Shields will go back to the top if they win at Grantham. 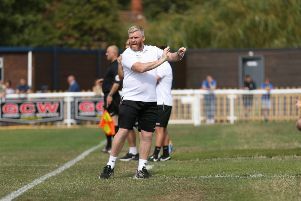 However, joint manager Lee Picton has warned his side they cannot afford many more slip-ups. He said: “You can’t say at this stage of the season that it’s an absolute must-win game, but we’ve got to do everything we can to go and get three points because if we keep slipping up, things will be taken away from us. “We can’t let ourselves get into that position where we have too much of a mountain to climb. Shields could be handed a double fitness boost ahead of the game. Defender Dillon Morse could only be named among the substitutes on Saturday because of a groin complaint, while striker Lee Mason missed out with a calf injury. The Mariners are hopeful about both players’ chances of being able to play a full part tonight. Grantham are 18th in the table and this week signed three players, including Lincoln City striker Jordan Adebayo-Smith on loan. Adebayo-Smith scored a hat-trick against Shields’ academy team in the FA Youth Cup earlier this season. Picton is expecting a difficult game as the Mariners look to recover from Saturday’s disappointment. He added: “We’ve had to dust ourselves down. “There are 14 games still to go and I’m sure there’ll be many twists and turns between now and the end of the season. “We’re no longer in the coveted position of having things in our own hands. Kick-off at South Kesteven Sports Stadium - which has a post code of NG31 7XQ - is at 7.45pm.